(kindly provided by Dr. Rob Marshall - additional information added by Avianweb). Native to Australia, Papua New Guinea and Indonesia, there are over 40 species. 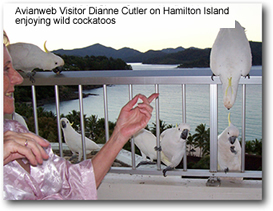 These can be divided into two main groups – the white cockatoos and the black cockatoos. 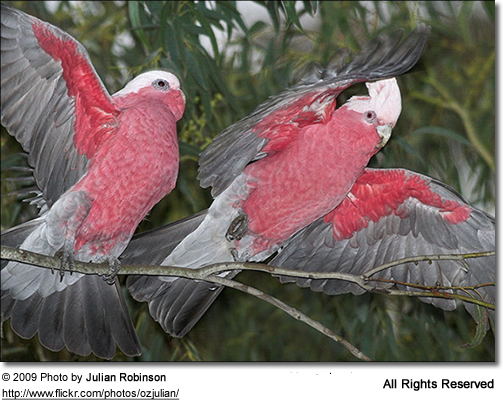 The species available as pets range from the well-known Sulphur Crested , the Galah, the Major Mitchell, the Red tail Black Cockatoo, to the lesser known White (Umbrella) Cockatoo. Outside of Australia, the Moluccan and Umbrella also make a lovely pets but are rarely kept as pets in Australia due to their expense. The most obvious external feature of a cockatoo is the erectile crest that raises immediately when alarmed or excited. When the crest is lowered, the feathers fold back over the head and the crest is hardly visible. As attractive as the crests are, their major purpose is communication. 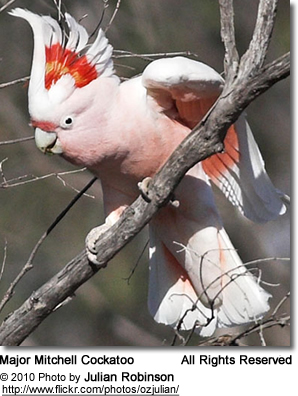 A raised crest can indicate that a cockatoo is displaying for its mate; defending its territory or its flock, calling its flock members; or he or she may be expressing curiosity, excitement, surprise, fear or frustration. For those approaching this parrot -a raised crest may be a warning not to touch them - or else risk being bitten. A lowered crest can indicate calmness, friendliness and general approachability. The strong, heavy beak is used to crack large seeds but can also produce a powerful and destructive bite. Consistent training from a young age will help ensure potential owners enjoy a bird free of this destructive habit. Hand reared male Red Tailed Black Cockatoos are generally less prone to bite and make better pets, especially for younger owners, for this reason. However, these birds require an extremely dedicated owner who is willing to provide significant and meaningful attention to this highly intelligent species. With a lifespan of up to 120 years with some species, these birds make wonderful life long friends. They have great characters, a “cuddly” nature and enjoy physical interaction with their owner. Birds deprived of this affection may become loud and develop unwanted behaviours. These friendly birds are good talkers but also possess the ability to make loud screaming noises. For this reason,they can be a challenging bird to keep and therefore require a committed owner who is willing to provide continuing obedience training. 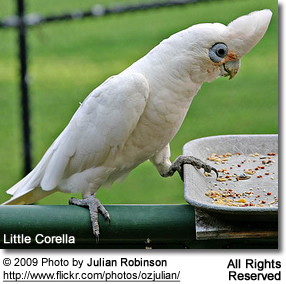 Psittacine beak and feather disease (Circovirus infection or PBFD) is a problem that is frequently encountered in the white cockatoo species. The black cockatoos are less susceptible to this disease. PBFD is chronic and incurable and results in poor feather growth and ultimately, complete feather loss. The beak is also affected and becomes fragile and does not repair itself. Due to its highly contagious nature to other parrot species, it is advisable to avoid any bird suspected of having this condition. They generally require an aviary no less than four to six metres long by one to two metres wide. The best breeding results are achieved when one pair per aviary is kept. The aviary wire should be a heavy-duty grade, as they can easily chew holes through lighter grade wire. Similarly, the frame should be constructed of steel to avoid the birds chewing the structure away. Hollow eucalypt logs are best suited for nest boxes and should be approximately 30-40 cm in internal diameter and about 1m in length. Larger Cockatoo Species: 15 - 18 wks. Weaning Foods: table foods mostly with tiny pellets, mixed dried fruit and vegetables; as well as mashed banana and oatmeal. For more information on weaning, please go to this website. These birds only breed once a year - usually between December and March, when vegetation growth is at its peak and food is readily available. As part of the courtship behavior, the male ruffles his feathers, spreads his tail feathers, extends his wings, and erects his crest. He then bounces about. Initially, the female ignores or avoids him, but - provided he meets her approval - will eventually allow him to approach her. Once he is accepted as a mate, they will both preen each other's head and scratch each other around the tail. This serves to strengthen their pair bond. Eventually, the male will mount the female and perform the actual act of mating by joining of the cloacae. For bonded pairs, this ritual is much shorter and the female may even approach the male. 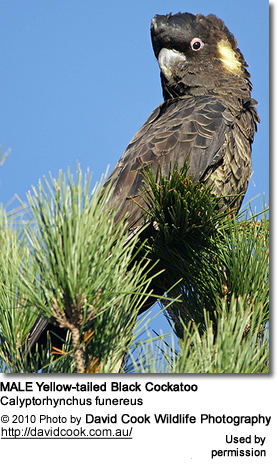 Pairs leave their group and find a nesting spot in a tree. They form a close bond that lasts for a lifetime. If they are separated, they may slip into a deep depression. In absence of a "true" mate, they may accept a caretaker as its mate. They also eat large insects, such as crickets (order Orthoptera) and skinks. Captive birds are usually provided a parrot mix containing various seeds, nuts and dried fruits and vegetables. Additionally, they need to be offered lots of fresh vegetables, fruits and branches (with leaves) for chewing and entertainment. Please refer to this webpage for information on what to feed these parrots. Stephanie Turner pointed out the following: "In Perth, Western Australia, they are planning to 'cull' Corellas; little Corellas and Long Billed. 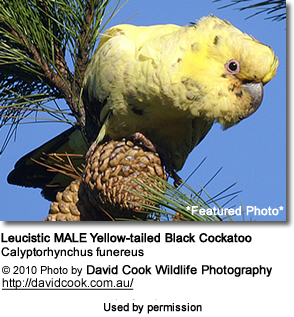 "Police in talks to shoot cockatoos in Maylands river parkland (published in Perth now"... Relevant excerpts: "DEC's senior zoologist Dr Peter Mawson said his department had sought approval from the City of Bayswater to carry out the cull and that police had expressed interest in 'assisting and participating' in the event ... Dr Mawson said the officers will take down the birds using either air rifles or low-powered .22 rifles but specific details are yet to be decided upon." One humane method for reducing the numbers of birds was successfully employed in Germany (Neunkirchen, Saarland). In a park by a river, a habitat was created for the exploding pigeon population. A beautiful tree house with nesting condos and a feeding station. The food they were fed contained some drug that basically rendered them infertile. The eggs they laid were duds thus resulting in a natural reduction of pigeon numbers. If culling is necessary, a humane solution should be chosen.